Is the human race still evolving? And if so, will future changes enable man to have more mastery over his environment, or lead to his destruction? To find answers to these questions, travel with Michael Duchesne to the jungles of Central America to free his kidnapped daughter and search for el Registro de Dios, a telling record of man’s evolution, hidden from the world for two thousand years. Joining the retired army ranger in his quest are his son, Mitch, and two young researchers who have successfully extracted DNA from sacrificial blood embedded in ancient Maya pottery. Their experiments reveal that a tiny variation in molecular DNA is responsible for startling changes in those who carry the altered gene. Only Dr. Herman Walenz, a rogue scientist under siege by his peers, knows the full impact the mutation will have on the future of mankind. But before he can present his findings, he mysteriously disappears, leaving Michael the keys to the doctor’s controversial work. To validate Walenz’s research and unlock the growing mystery, the team must recover el Registro and evade a deathtrap set by Michael’s archenemy, Rodolfo Soldano. What they discover will send shockwaves through the scientific establishment and constitute a full-scale assault on Darwin’s theory of evolution. 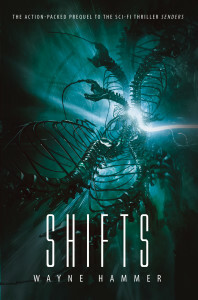 Shifts is available for purchase in all three formats at Barnes and Noble and Amazon.